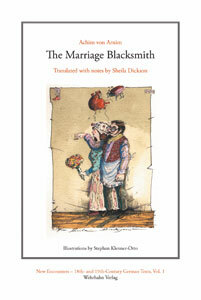 The Marriage Blacksmith is the translation of a short story written in 1830 by a German writer, Achim von Arnim (1781–1831). Set in Inveraray and Gretna Green, it describes a fictional visit to Scotland by a German natural scientist. Arnim’s writing is characterised by a grotesque mixture of the realistic and the outrageous, and in this story he embroils the family of the Duke of Argyll and its Shakespeare-loving servants in the adventures of a German U-Boot inventor, a beetle-catcher, an Indian princess who happens to be riding through the Scottish countryside on an elephant, and a German femme fatale who brings everyone together at the end over the blacksmith’s anvil, before herself flitting off alone into the sunset. This story has never before been translated into English and it presents an unconventional and scurrilous view of Scotland and its people in the early 19th century from the perspective of a well-disposed and highly imaginative foreigner.